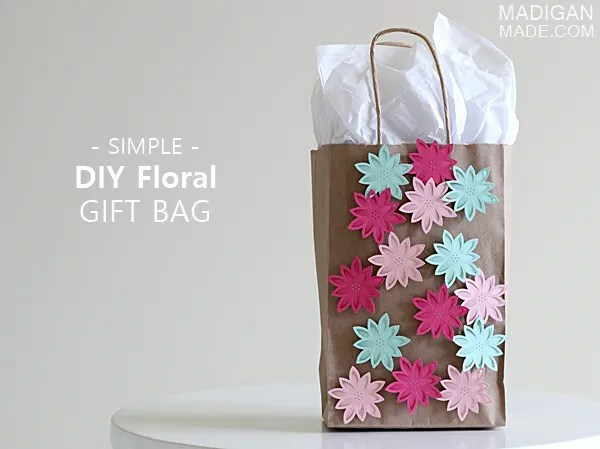 MAKE: a simple DIY decorated gift bag. I’m always amazed at how much it can add up when you give someone a gift. Between the greeting card, the wrapping paper, the ribbon and the gift bag… sometimes what is wrapped around the gift costs more than the actual present! That is why I try to get creative… I often make my own easy handmade cards and I try to keep my gift wrap simple. You can decorate inexpensive, plain gift bags instead of buying your own. I want to show you another easy way you can customize your own gift bag with scrap paper. I used this gift bag for a birthday present this summer, but you could easily change the colors or motif to make a custom bag for any occasion! To make this bag, it was pretty simple. In fact, my instructions for you are pretty brief. 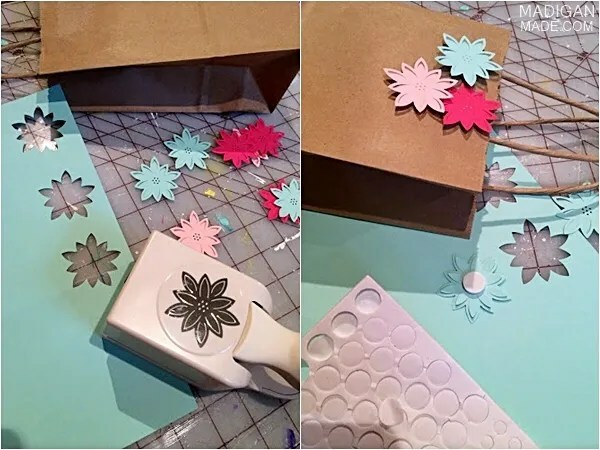 First, I punched out a bunch of floral shapes using the flower craft punch. Then I attached them to the front of the gift bag using the adhesive dots. I attached mine in a random, scattered pattern. That was it! The beauty of this project is that you can customize the colors (or punch shape) to your occasion or holiday. It is an easy way to customize your gift wrapping AND use up some scrap paper, too! And… it is an economical way to save when giving a gift.